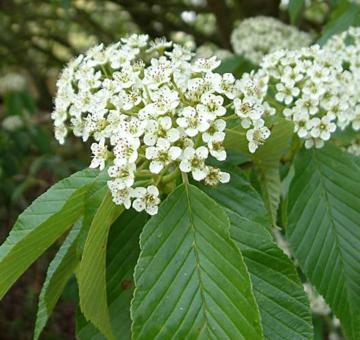 Small spreading tree or large shrub. Good dense foliage of oval to oblong, shallowly toothed, boldly veined deep green leaves Dense corymbs of pungently scented, small white flowers in spring, followed by small rounded, brown berries. Introduced from central China by Ernest Wilson in 1904.